Editor’s Note: The Knoxville News Sentinel, which first reported this story, announced Wednesday that it has been “unsuccessful” in its attempt to verify the full facts of the account. NBC News has not been able to independently authenticate the story. A terminally ill 5-year-old boy had his final wish fulfilled, dying in the arms of Santa Claus after he was afraid he would miss Christmas. Eric Schmitt-Matzen, with a classic long white beard and curled mustache, plays Saint Nick in Knoxville, Tennessee. 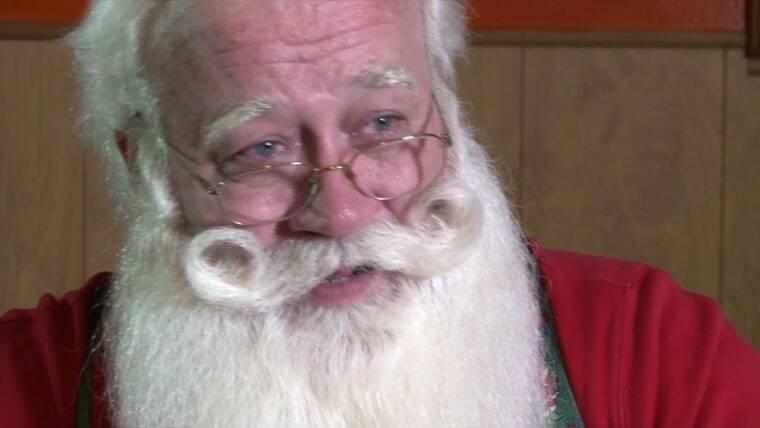 Schmitt-Matze told NBC affiliate WBIR in an emotional interview Monday how he answered the call to grant one child’s final wish to see Saint Nick before he died. “When I got there, it was my job to make sure he got Christmas," Schmitt-Matzen told WBIR through tears. Schmitt-Matzen said he had just gotten home from work about a month and a half ago a when a nurse at a local hospital called him and said she had a very sick child who wanted to see Santa. When he arrived, Schmitt-Matzen said he asked the unnamed boy’s family to leave the hospital room if they thought they would get too emotional so that he wouldn’t burst into tears himself. The boy’s mother gave him a gift to give the boy, “something he was always wanting,” he said, toys from the children’s animated series PAW Patrol. “What’s this I hear you’re going to be missing Christmas this year?” Schmitt-Matzen said he asked the boy. That’s when the boy told him he heard he was going to die. “Well, you’re not going to miss Christmas, the elves already had your present, we knew you wanted this for a long time,” he said he told the boy. “Really?” the boy asked, according to Schmitt-Matzen. He then gave the boy his gift “and that put a grin on his face,” he said. “I am?” the boy asked, perking up, according to Schmitt-Matzen. “You sure are, I’m sure they’ll let you right in,” he said. “And that’s when he passed,” Schmitt-Matzen said. Boys Ask Santa To Bring Military Dad Home, But Can He Deliver? Schmitt-Matzen first told his story to Knoxville News Sentinel Columnist Sam Venable and it has since gained national attention. He told the publication that after the boy died, his mother ran back into the room screaming, and he left as fast as he could. “I spent four years in the Army with the 75th Rangers, and I’ve seen my share of (stuff). But I ran by the nurses’ station bawling my head off,” he told the Knoxville News Sentinel. Schmitt-Matzen said he was ready to hang up his Santa suit for good in despair, but found the strength for one more children’s show. “When I saw all those children laughing, it brought me back into the fold. It made me realize the role I have to play,” he told the Sentinel. “For them and for me." "When I saw all those children laughing, it brought me back into the fold. It made me realize the role I have to play," he told the Sentinel. "For them and for me." “The News Sentinel cannot establish that Schmitt-Matzen’s account is inaccurate, but more importantly, ongoing reporting cannot establish that it is accurate,” the publication said in a post.